We are Australia's leading animal protection organisation. Our investigations and campaigns are recognised the world over. We unite millions of people who believe in a world where animals are free from cruelty. Become a member — or scroll down to learn more. Animals Australia is Australia's foremost national animal protection organisation. We represent some 30 member groups and over 2 million individual supporters. Animals Australia, along with our global arm, Animals International, has an unprecedented track record in investigating and exposing animal cruelty and for conducting world-first strategic public awareness campaigns. Investigate, expose and raise community awareness of animal cruelty. Provide animals with the strongest representation possible to Government and other decision-makers. Educate, inspire, empower and enlist the support of the community to prevent and prohibit animal cruelty. Strengthen the animal protection movement. Our investigations have been featured on every current affairs program in the country including Four Corners, 60 Minutes, Today Tonight, A Current Affair, 7.30, The Project, Lateline and Landline. Investigations throughout the Middle East and South East Asia exposing cruelty in the live export trade resulted in the first ever suspension of live animal exports — to Egypt in 2006 then Indonesia in 2011 — and sweeping reforms to the operation of the entire industry. An Animals Australia investigation into the factory farming of pigs in Australia which aired on 60 Minutes was a catalyst to the pig industry agreeing to restrict the use of pregnant sow stalls. And our ground-breaking investigations into 'live-baiting' in Australia's greyhound racing industry led to a government crack-down on the 'sport', dozens of trainers charged and jail time for perpetrators. Lyn White is Animals Australia's Investigations Director and Director of Strategy. 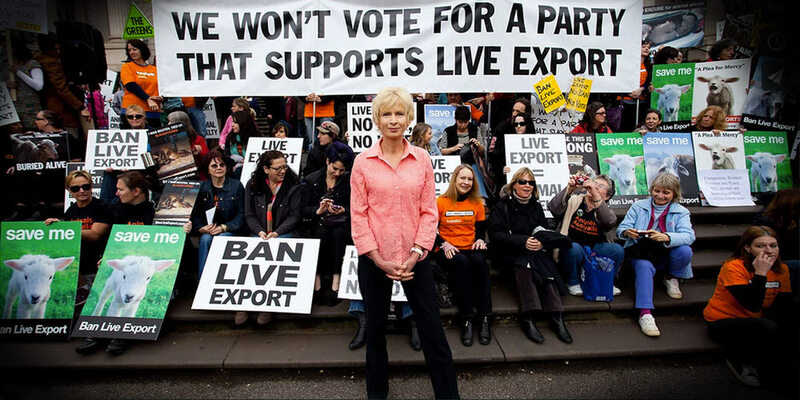 Recognised as one of Australia's foremost animal advocates and lobbyists, in 2014 she was appointed a Member of the Order of Australia for her significant contribution to the field of animal protection. Animals Australia is a charity recognised by the Australian Charities and Not-for-profit Commission (ACN 617 080 387). The organisation’s legal structure is as a not-for-profit ‘Company Limited by Guarantee’, established to prevent and relieve the suffering of animals. It is overseen by a six-member Board. The Board consists of four ‘Nominated Directors’ who are elected by member societies and currently two ‘Appointed Directors’ selected on the basis of their expertise. The organisation's Constitution allows a maximum of three ‘Appointed Directors’. The current Chair of the Board is Dr Christine Townend. The Chief Executive Officer is delegated responsibility for the daily operations of Animals Australia. Our headquarters are in North Melbourne and we are funded entirely through community support; we receive no government funding. Our important work on behalf of animals is reliant on the generosity of our members and donors. Animals Australia was formed in 1980. We were originally called the Australian Federation of Animal Societies (AFAS). Co-Founders Professor Peter Singer and Dr Christine Townend recognised the need to unite the many animal protection groups in Australia to provide a united and strong voice on behalf of animals. A primary activity of the first decade of 'AFAS' was lobbying for and then actively contributing to the Senate Select Committee on Animal Welfare (its 11 reports are still key documents). In 1986 the federation introduced 'individual membership' in addition to the society membership structure, and also accepted New Zealand member groups; changing our name to Australian and New Zealand Federation of Animal Societies (ANZFAS). In the late 1990s we reverted to Australian groups only, and the name 'Animals Australia' was adopted. The organisation now uniquely undertakes two interwoven roles — as a peak body representing a large number of grass roots groups, and a campaign-focussed organisation working to raise community awareness of animal cruelty and promote reform.